Craft time is an amazing way for your kids to get creative. But all those kid’s craft supplies can easily make a mess. To avoid letting your home become cluttered by craft supplies, it’s best to keep them stored away and organized. 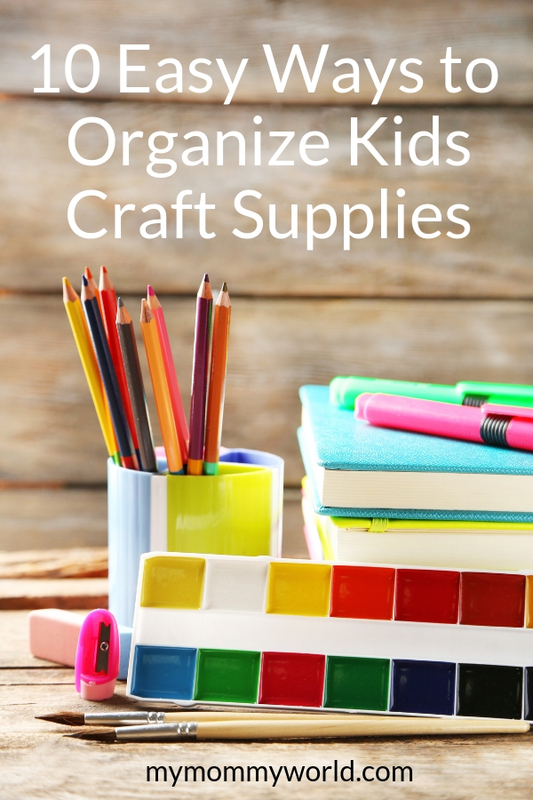 These 10 products are great ways to keep your kid’s craft supplies organized. Please note, this post contains referral links. See my disclosure policy here. For an all-encompassing storage solution for your kid’s craft supplies, a rolling storage cart is a good option. With tons of bins in a variety of sizes, you’ll be able to store away all your kid’s craft supplies. Then, you can pull them out when you need them and easily hide them away when they’re not in use. I love that this cart has a hard, flat top that your kids can use to work on their craft projects, or can be used for pencil holders or other storage containers. With bright colors and a variety of compartments, this kid-friendly storage center is a great option for a small selection of craft supplies. You can easily store your kid’s pencils, paint brushes, scissors, and glue in one handy place. If your kids only have a handful of craft supplies, a storage box is a wonderful storage solution. It’s small and compact, while also having tons of space for a variety of different craft supplies. With eight outer pockets and a removable interior separator, this portable storage caddy is an awesome way to hide away all your kid’s craft supplies. And with a set of handles, it makes transporting those supplies to different rooms of the house super simple. Sometimes, your kid’s craft supplies are tiny – making them difficult to store. For all your kids small supplies, like beads and buttons, a clear organizer case with storage compartments makes a great storage solution. This case also makes a great LEGO organizer too! If your kids love to paint, a paint brush holder is a must-have. It will not only keep their brushes organized, but it will allow you to set them upright as they dry. Desktop storage options are an awesome choice for craft supplies. And a carousel storage center is wonderful because it allows your kids to see exactly what’s inside each compartment as they work. If storage space is limited inside your home, a hanging storage option may be the best choice for you. To hid away your kid’s craft supplies when they’re not in use, simply fill up the compartments and hang this storage center on the back of their bedroom door. To keep a handful of everyday items within easy reach but still organized, a clear storage caddy is the way to go. Your kids will love this small caddy, which is the perfect size for little hands to carry around. For a storage solution that doubles as wall décor, this adorable set of storage pockets from American Girl is awesome. This storage solution comes with a set of storage pockets and a variety of decorative options so your kids can make it their own. With so many great storage tools available, it’s easier than ever to get your kids’ craft supplies organized so that they no longer take over your dining room table or kitchen counter. For more helpful tips on getting your kids organized, check out this post on Organizing Tips for Kids and How to Organize Toys. That’s a great idea Shelly!